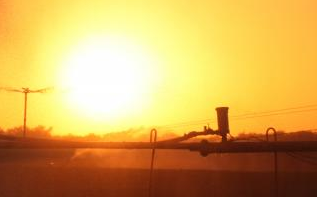 According to a recent Agriculture.com article, Nebraska is expected to experience above-average temperatures this summer, which could prove to be a challenge when it comes to planting, tilling, spraying, and haying. According to Dutcher, the higher temperatures will come alongside below-average precipitation through June and July and into mid-August. However, Nebraska could see potential heavy precipitation throughout the next two weeks, which means the moisture deficit may not start until the middle of June, he says. “Short-term model forecasts continue to point toward an active weather pattern for the western Corn Belt through mid-June,” Dutcher reports. “The models show continued development of upper air troughs over the western U.S., moving northeast toward the western Great Lakes. This is a perfect scenario for bouts of heavy rain and severe weather for the central and northern Plains. Planting, tillage, spraying, and haying could continue to prove to be a challenge in the short-term." While rainfall continues to sweep across the country, Nebraska may come up “on the short side for critical crop moisture” due to above-normal temperatures expected for later this summer, Agriculture.com reports.